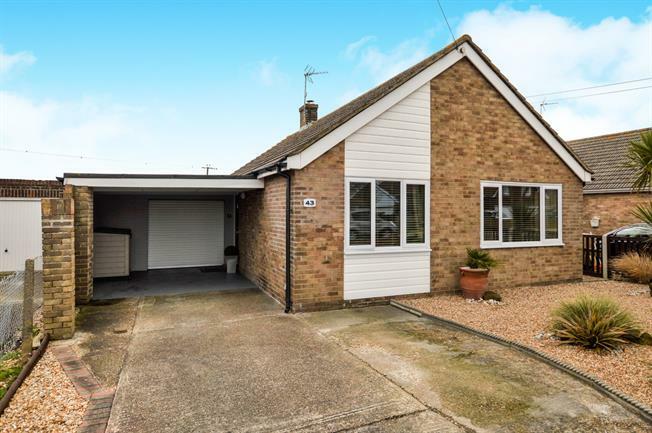 2 Bedroom Detached Bungalow For Sale in Romney Marsh for Asking Price £299,950. Absolutely stunning two bedroom detached bungalow backing onto conservation land with garage and off road parking. The lounge/diner has patio doors leading to the rear garden and French doors giving access to the kitchen. Good size kitchen with range of wall and base units with sink unit set in worktop. Gas hob with extractor fan over, electric oven, spaces for washing machine and fridge freezer. The conservatory overlooks the garden and has French doors leading to the garden. The master bedroom has built in wardrobes. The second bedroom has French doors to the lounge and the current owners use this as additional living space. Modern shower room with step in shower cubicle, wash hand basin, WC and tiled splash backs. The garage is larger than average and has an electric roller door and personal door to the rear. Handy car port and plenty of off road parking to the front. Lovely rear garden which is very well stocked with plants and shrubs, lawn area, raised beds, patio and far reaching views.